http://maientertainmentlaw.com/?search=buy-levitra-uk If you haven’t dyed your Easter eggs yet, there is still time. Time to do something more creative than the dye kits from the grocery store. 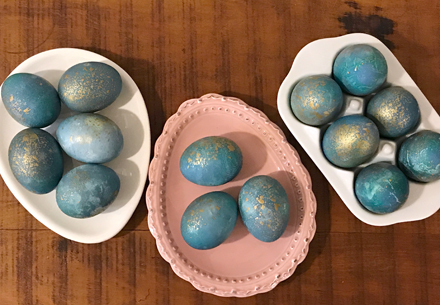 click Many years ago, when my now 20-something kids were in grade school and we had our own egg-laying chickens, I tried dyeing our eggs with natural ingredients for Easter. informazioni viagra generico a Bologna I used onion skins, beets, coffee, Red-Zinger tea bags, spinach, turmeric, chili powder and red cabbage. 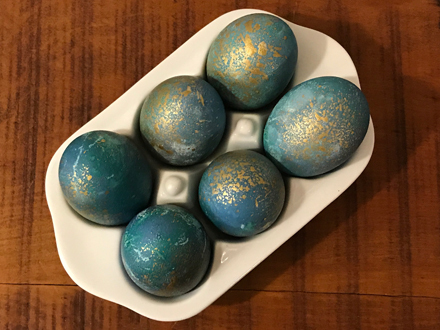 The only one I remember turning out as beautiful as the ones I’d seen Martha Stewart do were the eggs dyed with red cabbage. 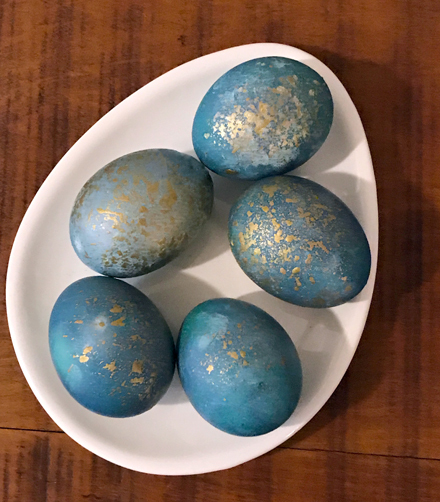 Maybe that is because instead of getting the red or purple eggs one would expect, the cabbage eggs come out a lovely shade of robin’s egg blue. 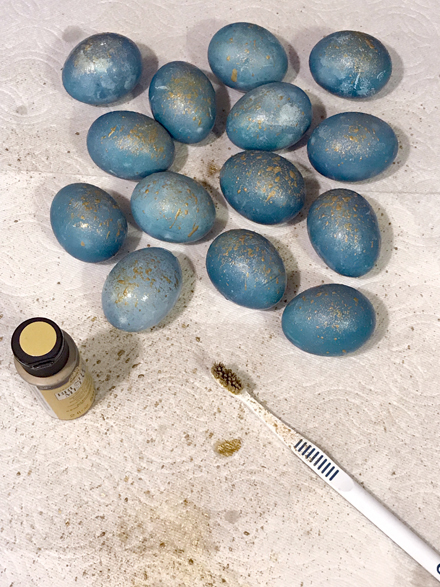 omprare viagra generico 25 mg consegna rapida I was inspired to make these gold speckled robin’s eggs when I thought back on those red cabbage blue eggs combined with the memory of the Robin’s Nest Cake I made last Easter. http://maientertainmentlaw.com/?search=order-accutane This is a “Do as I say – Not as I do” sort of recipe. I didn’t use enough cabbage and water to completely cover the eggs. 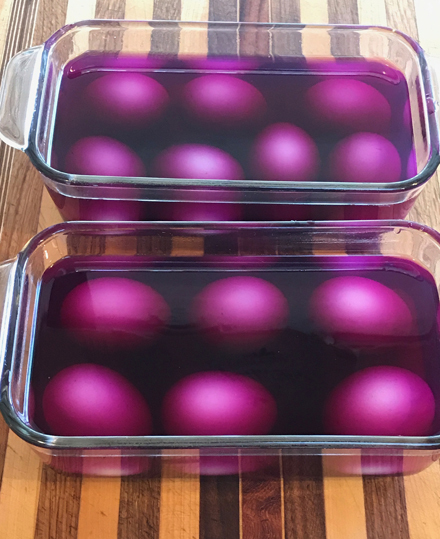 I had to use two loaf pans instead of one large Pyrex to dye my eggs. And I had to add back some of the cabbage (which I dug out of the trash can after discarding it) to displace the water enough to submerge the eggs. The recipe I’m giving you will make plenty of cabbage water to easily dye a dozen eggs. Additionally, I used regular metallic gold craft paint. 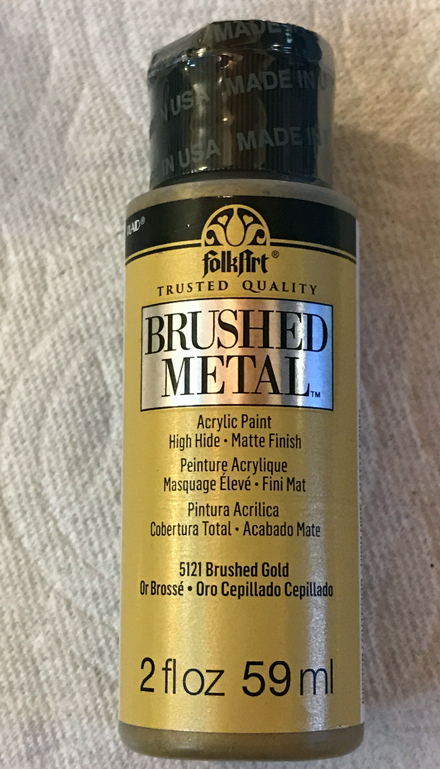 If you’re concerned about the paint, edible metallic paint is available. I am not concerned at all, but if by some fluke of a chance someone in my family becomes ill from eating the eggs, I’ll let you know. Chances are slim to none; so don’t worry your pretty little head about it. 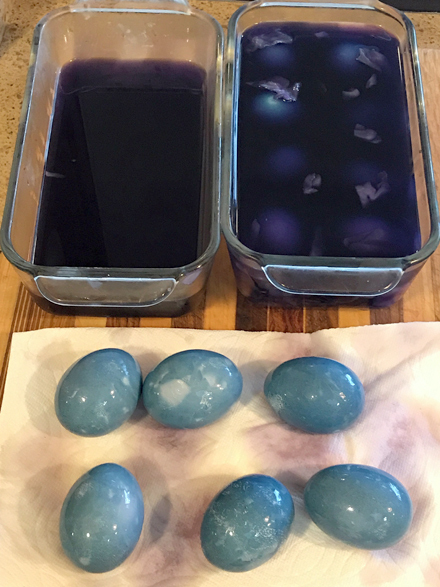 One more thing, I left my eggs in the dye for more than 8 hours, which, in my opinion, was too long. I think 3 to 4 hours is plenty of time to achieve the perfect robin’s egg blue. 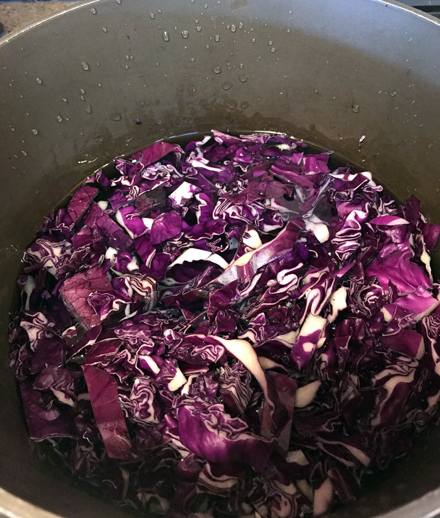 Place the chopped cabbage in a large pot. Add 8 cups of tap water to the pot, bring to a boil over high heat, reduce to a simmer, cover and cook for 45 minutes. Remove from heat and cool completely. Place a strainer over a large bowl and pour the cabbage into the strainer. Keep the water and discard the cooked cabbage. 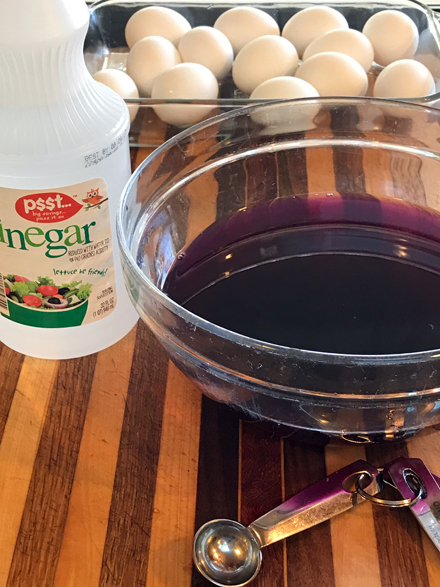 Whisk the vinegar into the cabbage water. 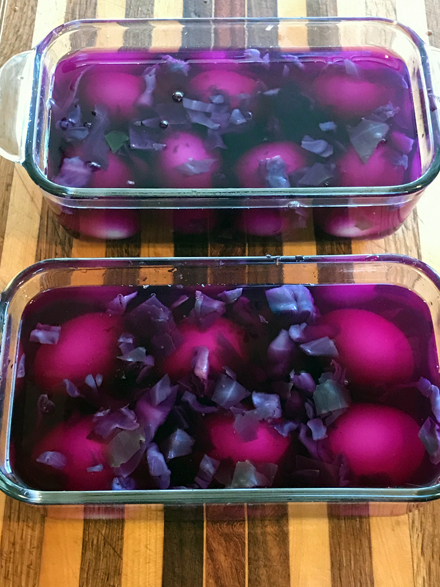 Place the hard-boiled eggs into a Pyrex dish and pour the cabbage dye over the top. Be sure that the eggs are completely covered and do not overcrowd the dish, it is best if the eggs are not touching each other. 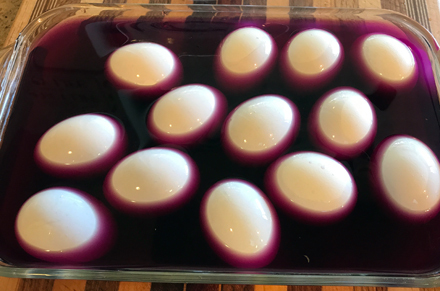 Refrigerate the eggs in the dye for at least 2 hours, or up to 8 hours, turning the eggs over half way through the soaking time. 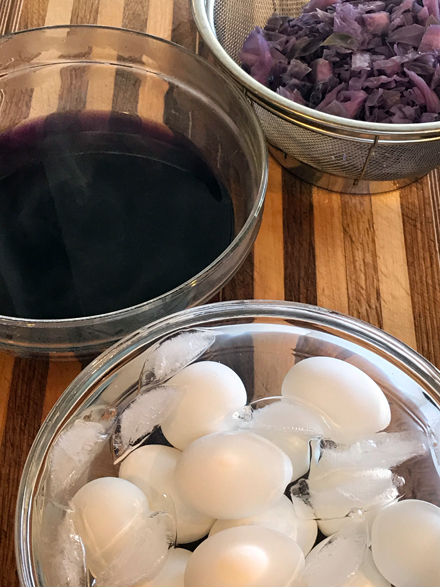 The longer the eggs soak, the darker they will become. 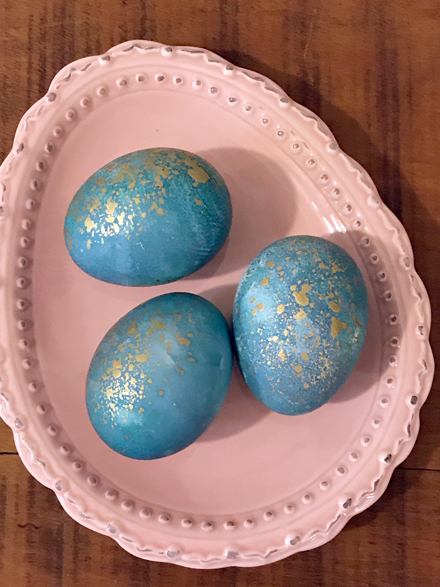 When you’ve achieved the color you like, remove the eggs from the dye to paper towels and dry completely. Cover a work surface with newspaper or paper towels. Place the dry eggs close together, but not touching, on the paper towels. Dip the toothbrush into the gold paint. Hold the toothbrush above the eggs and run your index finger gently along the bristles to splatter the paint onto the eggs. Let dry and then turn the eggs over and splatter the other side. Let dry and then refrigerate until ready to use. P.S. I was 100% successful in recovering the last 5,000 photos that had gone missing on my computer. Hope springs eternal!